Dimensions of consciousness are easily left behind as the human mind forgoes the characteristics of each thought form. Each thought form is merely a construct of beliefs taken on when in human form. As this human form changes its beliefs, the constructs that hold these beliefs begin to dissipate (to break apart) into the nothingness from whence they arrived. Ridding ones self of the thought forms upon the earth dimension becomes cumbersome when one is mired in the dramas of everyday life, when one has chosen to experience family life, expressing and experiencing each unique family member in human form. 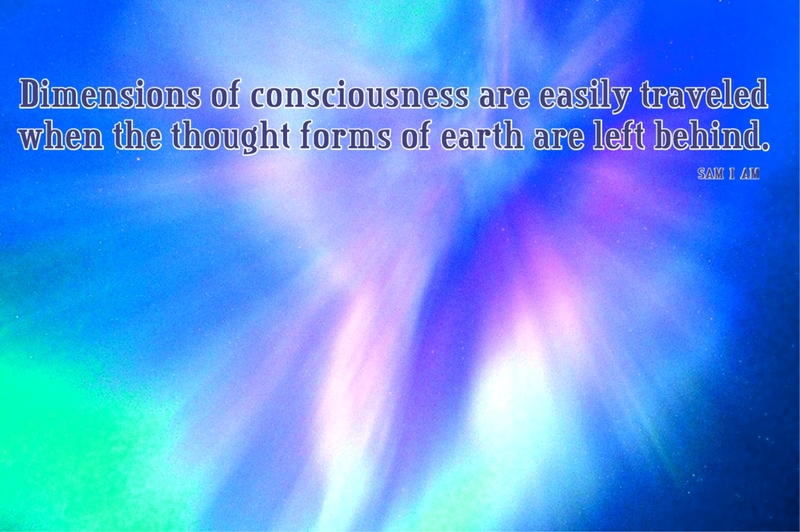 Dimensions of consciousness are easily traveled when the thought forms of earth are left behind. Each thought form holds unique aspects. Upon dissipation, each thought form shatters (breaks apart) as unique aspects are separated from it. Take, for instance, the thought form of your body. The body holds many constructs, the arms, the legs, brain, organs, heart and so forth. Taking each of these, doing away with them in the mind, and allowing the body to become an ethereal form without organs, without arms or legs, without feet or eyes or hands, etc, helps to rid one of this construct that can be limiting when traveling in other dimensions of awareness. Each dimension holds clues to the humans awakening. Traveling these dimensions is easily done in the sleeping state as one dissipates the human thought form to move though dimensions as not a human but as an experience, as an experience had in mind, the small mind of one. This can be the beginning step to moving into greater states of awareness, for it is only when one leaves behind the human form that greater states of awareness are achieved. We leave you now with this thought: the characteristics of each thought form must be thoroughly dissipated to move though increasing states of awareness beyond your earth. Previous PostRadiating Heart EnergyNext PostExpanding LIGHT!